It’s amazing how much things can change in just a few months’ time. Back in October, I created 10 slides that highlighted the extent of California’s 6-year drought through its dwindling reservoirs. Now, just 5 months later, it seems that the situation has been totally reversed due to a series of storms and snows that have filled many lakes and reservoirs to the brim. Almost 77% of California is currently out of the drought, compared to just 9% of the state that was drought-free at the end of October, and just 3.6% in March 2016. This hasn’t come easy though. In February, 188,000 people around Lake Oroville evacuated their homes over concerns that the aging dam’s emergency spillway could fail. The total cost for repairing the crumbling spillway and for the emergency response is almost $200 million. 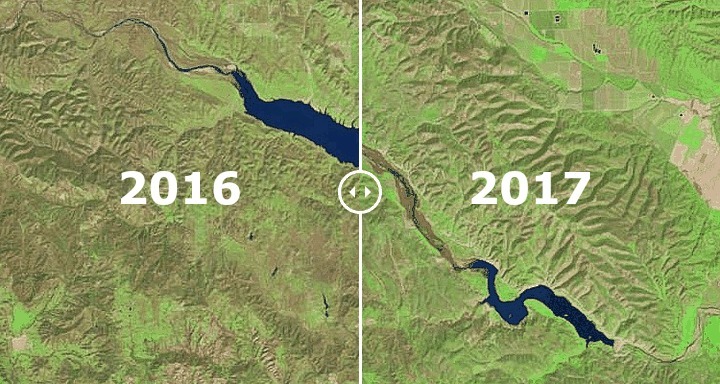 Below are 12 before/after images that show how the California reservoirs have increased, compared to the same period of 2016. As always, images are provided by the Landsat 8 satellite. Note: Oroville Lake is missing from the list, because there is not a recent cloud-free image available yet. I will update the post as more images become available. Move the slider over each image to see the changes. After having almost completely dried, Lake San Antonio will reopen in April for the first time since 2015, first on weekends only, and then 7 days/week starting with May 19th. Lake Nacimiento was 94% full at the end of February compared to just 24% at the end of February 2016, prompting the release of billions of gallons of water through its spillway. Lake Cachuma was another reservoir that was hit very hard by the drought. Even though it was still below the historic average at the end of February, it’s currently in a far better shape than it was a year ago, and boats are able to launch at the lake once again. If you find it difficult to notice where a reservoir could be in the first image, that’s totally understandable. But moving the slider will reveal something stunning, a reservoir completely reborn. Lake McClure was 90% full at the end of February, up from 18% in February 2016. Don Pedro Reservoir, the 6th largest in California, rose almost to full capacity, after being less than half full during the same period of last year. New Melones Lake rose to 66% of capacity, up from 19% in 2016. The reservoir is the fourth largest in California. San Luis Reservoir, the 5th largest in the state, was nearly empty in August but made a remarkable comeback and is now full. Indian Valley Reservoir went from 18% full at the end of February 2016 to 81% full this year. Trinity Lake is the third largest in California by capacity, and went from being 35% full to 79% full. Diamond Valley Lake is one of the most important reservoirs in Southern California. It rose from being 38% full to 79% full, and was the scene of spectacular wildflower blooms. I couldn’t leave out California’s largest reservoir, Shasta Lake. The change in Shasta Lake is not very spectacular visually, probably because it was already 61% full at the end of February 2016.